Corby Town will take on Matlock Town at Steel Park on the opening day of the Evo-Stik Northern Premier League Premier Division. Tommy Wright’s new-look team will kick-off in front of their own fans on Saturday, August 13 before they face back-to-back away matches at Halesowen Town (August 16) and Whitby Town (August 20). The August bank holiday sees them host Coalville Town on Saturday, 27 before they travel to Spennymoor Town two days later. The Steelmen have a Christmas Eve home clash with Halesowen on the calendar and they will head to Grantham Town on Boxing Day before the return match with Spennymoor rounds off the festive fixtures. 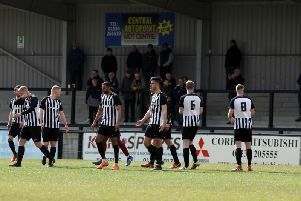 Corby’s run-in sees them travel to Stafford Rangers on Easter Saturday, April 15, they will then host Grantham Town on Easter Monday before heading to Coalville on the final day of the regular season on Saturday, April 22. The Steelmen, meanwhile, make the short trip to Rothwell Corinthians for their next pre-season friendly tomorrow (Saturday, 3pm).